by Talen on October 27, 2009 in Bangkok, Thailand Attractions, Thailand Pictures, Thailand Wats 13 Comments - Leave a comment! Wat Phra Kaew, also known as the temple of the Emerald Buddha, resides within the grounds of the Grand Palace in Bangkok and is considered the most revered Buddhist shine in all of Thailand. The Emerald Buddha itself is actually carved of jadeite, stands 26 inches tall and sits atop a large gold alter in the center of the temple. Only the King of Thailand is allowed close to the Emerald Buddha when the seasonal gold costume it wears is changed three times a year. The summer costume consists of a crown and jewelry, the winter costume is a golden shawl and the costume worn during Buddhist Lent is a gilt robe and headdress. The costume change is an important Thai ritual performed by the King who will also sprinkles water over the gathered monks and the faithful to bring good luck during the upcoming season. The other two costumes are on display in the nearby Pavillion of Regalia, Royal Decorations and Thai Coins while not in use. According to popular belief the Emerald Buddha started it’s journey in Sri Lanka but modern historians have discounted most of the Buddha statues early history and are confident that the Buddha image was carved sometime during the late 14th century to the mid 15th century in Northern Thailand. Although, the statue is carved in the style and attitude of Buddha images found in Southern India or Sri Lanka with the Buddha in a meditation pose. The meditation pose has never been prominent in Thailand which may have lead early historians to assign an alternate history to the Emerald Buddha. The history from this era says that the Buddha was once hidden in a Chedi in the Chiang Rai province, but a lightening storm in 1434 damaged that Chedi exposing a stucco likeness of the Buddha. Upon closer inspection the stucco was falling off exposing the Jadeite Buddha below. Being such a beautiful dark green it was confused as being made of emerald at first, giving the statue it’s name The Emerald Buddha. The King of Chiang Mai at the time heard of this wonderful discovery and decided that the statue must reside within his province. Three times he sent an elephant to Chiang Rai to retrieve the Buddha and three times the elephant stopped at a crossroads while returning with the Buddha. This was seen as a sign from Buddha himself and a temple was constructed in Lampang where the Emerald Buddha stayed for 32 years. The next king of Chiang Mai decided the Emerald Buddha should be housed in his province as well and this time the Emerald Buddha was successfully moved from Lampang to Chiang Mai where it resided in a temple until 1552 when invaders from Laos stole the emerald Buddha. The statue remained in Laos for the next 214 years until General Chakri, who would later become King Rama I, brought the statue back to the capital at Thonburi after a successful war with Laos. In 1784 When King Rama I moved the capital across the river to Bangkok he had the ordinance hall built where the stature still resides to this day. The ordinance hall was a plain stucco structure when it was first constructed but King Rama III would change all of that. Large stucco moldings were installed and the whole hall was gilded and adorned with glass mosaics. A pair of Khmer lions, believed to be from the Khmer Bayon period of the 13th century, guard each of the six entrances. At the base of the ordination hall is a row of golden Garuda’s each holding a Naga in each hand. The Garuda is the King of all birds and the mount of Vishnu the great Hindu god, the Naga is the king of all serpents and the enemy of Garuda. The Garuda holding the Naga is believed to be a very powerful image to chase away evil spirits. The ordination hall also contains two other interesting Buddha statues. Both ten foot tall statues are cast in bronze and stand crowned at either side of the Emerald Buddha. These statues were commissioned by King Rama III in dedication to King Rama I and King Rama II. The Temple of the Emerald Buddha is one of the most visited tourist attractions in Thailand, and rightly so. The attention to detail inside as well as outside the ordination hall is stunning. The compound surrounding the ordination hall is equally as stunning with the various monuments and buildings glinting in the midday sun. Getting a picture of the famous Emerald Buddha is sometimes easier said than done though. No pictures are allowed inside the ordinance hall which leaves you only two vantage points to get your photo. The first is through the open doorway at the front of the hall and the second is through a small open window cut into the front wall of the hall. Wat Phra Kaew is absolutely a must see while in Bangkok and it is sure to give you memories that will last a lifetime. Talen-not a place I have visited but clearly worth the effort. Great photographs enhance an interesting article. .-= Mike´s last blog ..Thai Ladyboy Crackdown-Double Standards in Phuket? =-. Thanks for the kind words Mike. You really should see it when you get the chance…photo’s do it absolutely no justice. OK, that emerald Buddha is impressive. Great pictures, Talen. Really gives me a sense of the temple and its location. Good history lesson, too. I was nearby last year but didn’t know quite where it was. My mistake. I should have looked harder. You’d think the dumb farang would have a map handy! .-= SiamRick´s last blog ..Asian dating sites, part 3: Looking in Thailand =-. Rick, It really is impressive especially when you consider how small it really is. It’s almost impossible to miss as it resides in the Grand Palace complex which is huge.Just follow the crowds. Maps are ok but getting lost usually ends up with better finds. Talen, I have been several times, but not with my new camera. So… it is time to go again (and I am looking forward to it). I’ve been reading a number of monk books this month and I believe the monks can get close with a camera. So if you do know any monks, they would be the ones to ask perhaps? 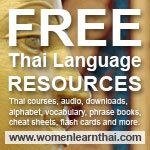 .-= Catherine´s last blog ..Thai Language Thai Culture: Pali and Sanskrit Roots =-. I can definitely see going to the Grand Palace multiple times Cat. So much to see and so much to take pictures of. I don’t think monks are allowed to take pictures in the hall either but I could be wrong. .-= will´s last blog ..???????? =-. Talen a very educational post and some nice photos as well. I really do enjoy these history lessons that are contained within many of your posts. The Chiang Mai and Lampang background to the Emerald Buddha is interesting and I love these kind of stories from way back then. I am slowly getting around to seeing the wonders of Thailand having now ticked the Floating Market off my list. The Emerald Buddha is a definite attraction that I want to see but when I get round to spending a few days in Bangkok heaven knows. I must try and make a big effort to stay a few nights in the capital some time next year. You’ve convinced me there is so much to see and a lot of history to gain. .-= Martyn´s last blog ..Thailand’s Famous Floating Market =-. Thanks Martyn, Like you I’m not big on being in Bangkok for long with all the traffic, smog and noise but I found that when you are seeking out places like this they become little refuges from the real Bangkok. They definitely make for great day trips. Hello, I will be in Bangkok in three weeks time. a friend of mine would like me to leave a jade mala and a message on the alter, is this possible and what would happen to the items over time??? can you also light a candle at the alter. Russell, you are allowed in the temple but the general public isn’t allowed near the jade Buddha I believe only the monks and the royal family get close to it. I don’t believe the public can light candle inside the shrine either. You migt want to ask the monks when you get there perhaps they would place something on the alter for you.